The East End of London has historically been a symbol of poverty and hardship. Late 17th-century prosperity, primarily driven by the silk trade, was followed by a long period of decline in the mid-18th century as the industry slumped. In the late 19th century, tireless efforts were made by some to alleviate the harsh conditions that had arisen, yet despite these efforts, degradation continued long into the 20th century. An already sorry condition was then exacerbated further during the Second World War, when the infrastructure of much of the area, including the docks, railways and industry, were targeted and destroyed in the Blitz. After the last of the dockyards closed in 1980, the future of the East End looked bleak, but since that time, the area has undergone a massive regeneration programme, with infrastructure and construction projects such as the Docklands Light Railway, Canary Wharf and more recently the Olympic Park. In the last five years, regeneration has taken on a new and surprising face. Strange as it would have seemed to those living through previous eras, large swathes of the East End are now thriving, due to an influx of digital technology and media companies setting up offices in the area. Some of the first technology companies to locate in the area include Dopplr, Last.fm, Consolidated Independent and Livemusic. In recent years they have been joined by some of the biggest names out there: Google, Amazon, Samsung, Intel, Cisco and Facebook, as well as some of the fastest-growing companies in the sector, such as Hailo, MindCandy, Unruly Media, Transferwise, Import.io and Huddle. The area also is home to the EMEA headquarters of our parent company, CareerBuilder. In 2010, the area became known as Tech City after a new initiative to support the development of this technology cluster was announced by the Prime Minister, David Cameron. Tech City, or Silicon Roundabout as it is sometimes called owing to it being centred at Old Street Roundabout, was established to identify the needs of the area, to attract investment, and to liaise with the government to create opportunities for future growth. 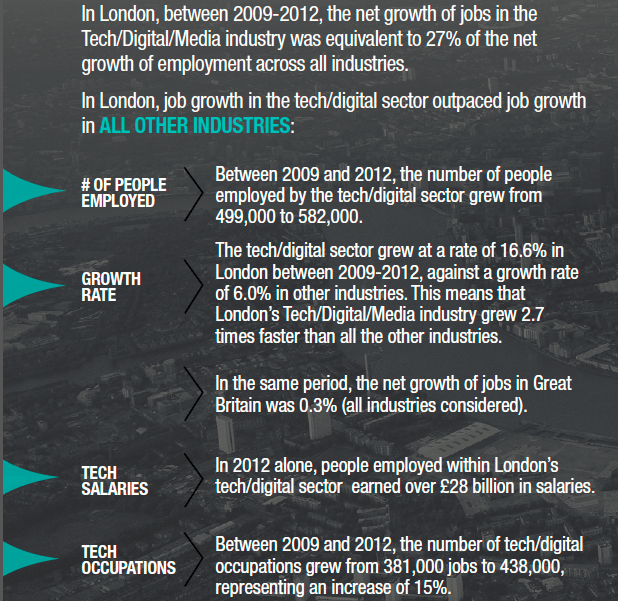 The success of Tech City over the past few years appears to have been startling, but this is not a mere perception. The perception is backed up by hard data, and to emphasise the remarkable regeneration that has occurred, Mr. Cameron quoted some figures from the report that demonstrate what has happened. The figures are impressive, and for us all the more so since they were all taken from EMSI data. 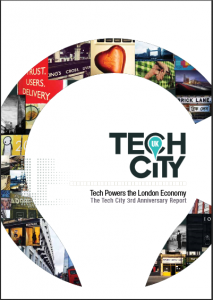 In fact, EMSI, together with CareerBuilder, is acknowledged by Tech City as the Data Partner for the report. The importance of this data and what it means for Tech City and for the UK as a whole was not confined to the report or to Mr. Cameron’s comments, but was picked up by various news organisations such as Bloomberg, in an interview with Joanna Shields, Chairman and CEO of Tech City Investment Organisation, and also by the BBC. Both EMSI and CareerBuilder are excited to have been part of this project, and we are thrilled to have been able to use our cutting-edge data to confirm the growth of a cutting-edge sector. For more information about EMSI data, please contact Andy Durman (andyd@economicmodelling.co.uk). For more information about CareerBuilder, please contact Sanja Licina (sanja.licina@careerbuilder.com) and check out their press release here.